Schiphol Group is a Leading Airport Operator in the Netherlands. Amsterdam Airport Schiphol is not the Netherlands’ only gateway to the rest of the world. Though the operation of this hub airport is one of our principal activities, the other airports we operate in the Netherlands further extend our reach and impact. Schiphol Group is the owner and operator of Rotterdam The Hague Airport and Lelystad Airport, and holds a majority share in Eindhoven Airport. We also work closely with foreign airports which can strengthen our position. They include the airports of Aéroports de Paris, in which we have an 8% cross-participation. In addition, Schiphol Group is involved in the activities of JFKIAT at JFK International Airport’s Terminal 4 in New York. We are also engaged in strategic collaboration with Incheon Airport, have an interest in Brisbane Airport and have activities at the airports of Hong Kong and Aruba. These international activities account for a significant part of Schiphol Group’s results. We conduct our domestic and international operations in a balanced manner, and in doing so reflect our key values of reliability, efficiency, hospitality, inspiration and sustainability. Thanks to these activities and the strength of the group we are able to invest in growth and the highest standards of quality. By joining forces with our sector and business partners, the authorities and the local community, we can achieve our ambition to further develop Mainport Schiphol as a multimodal hub. We are positioning Amsterdam Airport Schiphol as Europe’s Preferred Airport – the first choice of passengers, airlines and logistics services providers. Over the years, Schiphol has grown to become one of the largest hub airports in Europe, with 322 direct destinations. In 2015 the number of travellers served by Schiphol grew by 6.0% to over 58.2 million. Cargo volumes were down by 0.7% to 1.6 million tonnes. Schiphol is an important marketplace, with the airport site alone accommodating some 500 companies that together employ around 65,000 people. The rest of the group is also growing. The number of travellers served by Rotterdam The Hague Airport and Eindhoven Airport grew by 0.3% and 10.3% respectively. In 2015 a total of 64.3 million passengers travelled through Schiphol Group airports, a rise of 6.1%. To maintain its position and enable it to continue fulfilling its socio-economic role, Schiphol Group invests in infrastructure and facilities at these airports, seeking to balance a reasonable return on its equity and a stable dividend stream, on the one hand, with a moderate development of airport charges for airlines on the other. Our sound financial policy is aimed at safeguarding full independence in the financing of our business, both today and in the future. Schiphol Group has four shareholders: the Dutch state (69.8%), the municipality of Amsterdam (20.0%), Aéroports de Paris (8.0%) and the municipality of Rotterdam (2.2%). 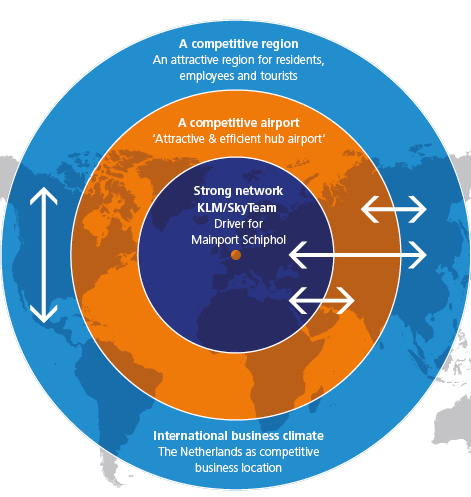 Our job is to maintain and further develop Mainport Schiphol’s position as a multimodal hub. To do this, Schiphol Group must be successful across the board. Five themes underpin our strategy for meeting this challenge: Top Connectivity, Excellent Visit Value, Competitive Marketplace, Development of the Group and Sustainable & Safe Performance. It is Schiphol Group’s ambition to continue to develop Schiphol into Europe’s Preferred Airport for travellers and airlines alike. We are proud that passengers rate Schiphol highly and choose the airport as their preferred point of departure or transfer. Our policy seeks to maintain this leading position in Europe, which requires a clear strategy and close cooperation with our partners and stakeholders. Amsterdam Airport Schiphol’s position as a Mainport is crucial to the Netherlands. To strengthen Schiphol’s economic function and to meet the noise mitigation agreements, the parties in the Alders Platform agreed to allow Schiphol scope for continued, selective growth. To accommodate such selective growth at Schiphol, Eindhoven Airport and Lelystad Airport are undergoing development as alternative airports for non-Mainport-related air traffic. Furthermore Rotterdam The Hague Airport and Eindhoven Airport have their own networks to serve the business and non-business (leisure) markets in their respective regions. Our international activities make a significant contribution to the group’s strategy and financial results, and strengthen Schiphol’s Mainport function. This is exemplified by our involvement in the development of Terminal 4 at John F. Kennedy International Airport in New York. Our strategic alliance with Aéroports de Paris, the airport operator of airports including Paris Charles de Gaulle (Europe’s largest SkyTeam hub), is equally important. At the same time we are gaining beneficial experience of other business models. Our international presence moreover helps raise awareness of the Schiphol brand.